Frances Theresa Densmore (May 21, 1867 – June 5, 1957) was an American anthropologist and ethnographer born in Red Wing, Minnesota. Densmore is known for her studies of Native American music and culture, and in modern terms, she may be described as an ethnomusicologist. 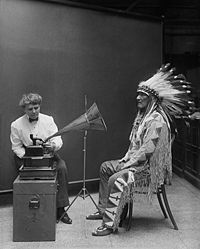 Densmore with Blackfoot chief, Mountain Chief, during a 1916 phonograph recording session for the Bureau of American Ethnology. As a child Densmore developed an appreciation of music by listening to the nearby Dakota Indians. She studied music at Oberlin College for three years. During the early part of the twentieth century, she worked as a music teacher with Native Americans nationwide, while also learning, recording, and transcribing their music, and documenting its use in their culture. She helped preserve their culture in a time when government policy was to encourage Native Americans to adopt Western customs. Densmore began recording music officially for the Smithsonian Institution's Bureau of American Ethnology (BAE) in 1907. In her fifty-plus years of studying and preserving American Indian music, she collected thousands of recordings. Many of the recordings she made on behalf of the BAE now are held in the Library of Congress. While her original recordings often were on wax cylinders, many of them have been reproduced using other media and are included in other archives. The recordings may be accessed by researchers as well as tribal delegations. Some of the tribes she worked with include the Chippewa, the Mandan, Hidatsa, the Sioux, the northern Pawnee of Oklahoma, the Papago of Arizona, Indians of Washington and British Columbia, Winnebago and Menominee of Wisconsin, Pueblo Indians of the southwest, the Seminoles of Florida, and even the Kuna Indians of Panama. Densmore frequently was published in the journal American Anthropologist, contributing consistently throughout her career. She wrote The Indians and Their Music in 1926. Between 1910 and 1957, she published fourteen book-length bulletins for the Smithsonian, each describing the musical practices and repertories of a different Native-American group. These were reprinted as a series by DaCapo Press in 1972. She also was a part of "A Ventriloquy of Anthros" in the American Indian Quarterly along with James Owen Dorsey and Eugene Buechel. ^ a b Gilman, Rhoda R. (1989). The Story of Minnesota's Past. Saint Paul, Minnesota: Minnesota Historical Society Press. p. 16. ISBN 0-87351-267-7. ^ "Frances Theresa Densmore". Oberlin College Archives. Retrieved 18 February 2013. ^ "Frances Densmore". Smithsonian Institution Archives. Retrieved 11 September 2012. ^ Kennedy, Stetson (1989k). Palmetto Country. Tallahassee, Florida: Florida A&M University Press. p. 354. ISBN 0-8130-0959-6. ^ Piehl, Cindy; Jodi Ratzlaff. "Frances Densmore". Minnesota State University, Mankato. Archived from the original on 2007-10-18. Retrieved 2007-09-03. ^ Rice, Julian (1994). "A Ventriloquy of Anthros: Densmore, Dorsey, Lame Deer, and Erdoes". American Indian Quarterly. 18 (2). JSTOR 1185245. Finding Aids to Collections in the Smithsonian Archive of Folk Culture, includes a finding aide for a Densmore collection of wax cylinders. "The Study of Indian Music" by Frances Densmore, in the Smithsonian Annual Report for 1941; includes good information on Densmore's equipment and methodology.